One of the gifts my daughters received for Christmas were light-up toy lightsabers. Sammy received "Rey's" lightsaber and if you've seen the most recent installments of the franchise you know this is also "Luke's" lightsaber from the original trilogy and "Anakin's" lightsaber from the prequels. The story of how that came to be is rather convoluted but I think the more interesting story is how this particular lightsaber prop came to be designed. Here's a hint: it has something to do with a accessory for an obsolete medium-format camera. In 1976 the production design team was hard at work creating the cinematic universe for Star Wars. It's important to remember that the original movie had a relatively low budget and many of the props were and sets were cobbled together from things that already existed in the real world. The story goes that a set decorator went into a photography store to buy a couple of lenses to make a pair of futuristic binoculars. While he was there he asked if the store had any "interesting" gear that no one was buying anymore. He was pointed in the direction of a box included the flashgun for a Graflex Speed Graphic camera. This particular camera was popular with photojournalists in the 1940s and 1950s but by the 1970s it was out of production and rarely used. 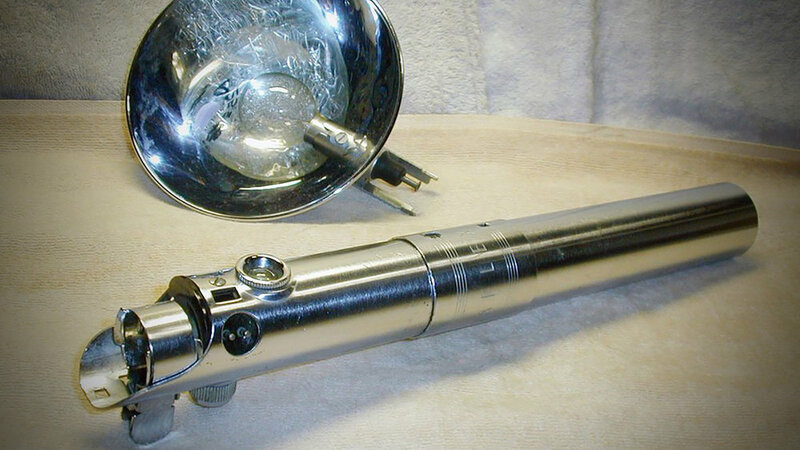 The flashgun consisted of a cylindrical metal tube containing batteries that connected to a bowl-shaped flash mechanism. He took one look at the metal tube and he saw Luke's lightsaber. Some additional detail was added including plastic strips for the grip and parts from a Texas Instruments calculator (there's always a Texas connection), but the basic form of Luke's iconic lightsaber was sitting there all along in a box of unused camera parts. 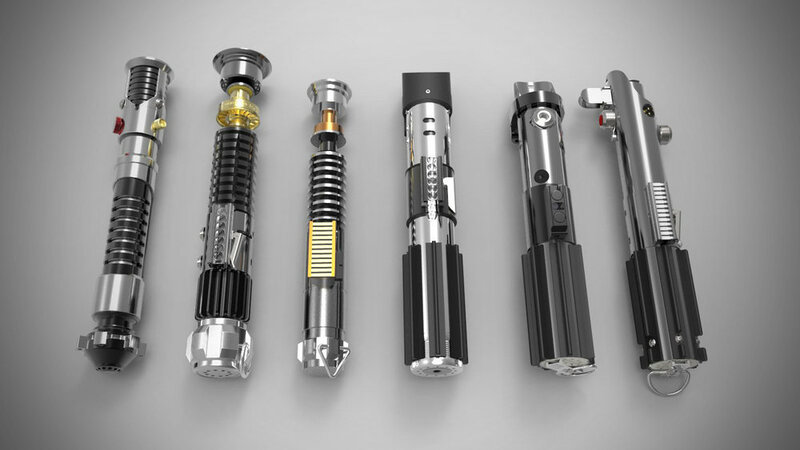 The movie's other lightsabers were made in similar ways: Obi-Wan Kenobi's lightsaber notably made use of both a residential sink knob as well as a part form an aircraft machine gun. For me the moral to this story is that good design can come from anywhere. You just have to remember to keep your eyes (and your mind) open so that you can see it. In an earlier post I wrote of how the Star Wars universe would have been considerably safer had they decided long, long ago to install more guardrails. After seven films where Jedi, Sith and smugglers are all constantly falling to their doom I was thrilled to see in the newest episode that basic safety measures are beginning to be implemented in that galaxy far, far away. 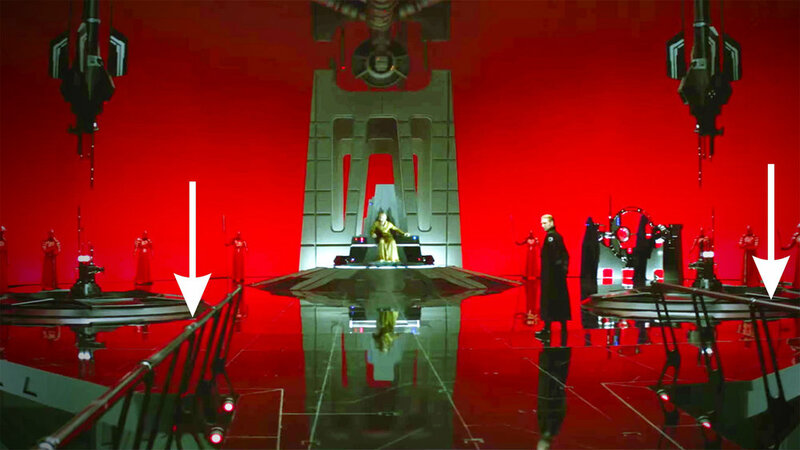 Guardrails can clearly be seen in Supreme Leader Snoke's throne room (see above). In terms of occupant welfare this is a definite improvement and as illustrated in the film it results in a much safer environment for all those who occupy it. And with that I wish all of you a happy 2017. I'll see you in 2018.